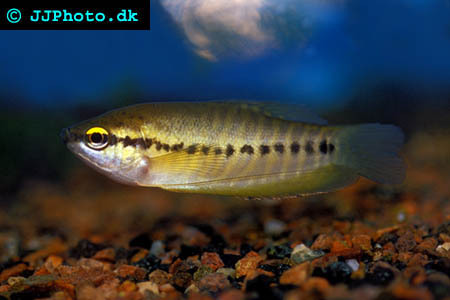 Company: Trichogaster pectoralis (Snakeskin Gourami) is suitable for community aquariums. Do not keep adult specimens together with small fish. Aquarium setup: They require a large aquarium tank. The aquarium tank should be heavily planted and contain floating plants. Avoid heavy circulation. Feeding: This Gourami species accepts flake food. 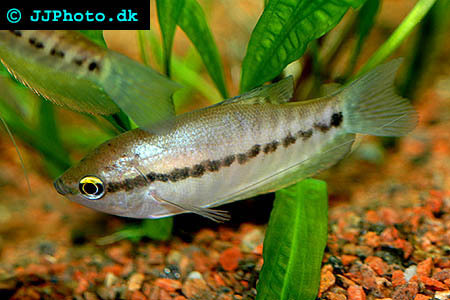 Breeding: Breeding Trichogaster pectoralis (Snakeskin Gourami) requires a large aquarium. The males build bubble nest on the surface among plants. The spawning can be triggered by raising the water temperature in the aquarium and lowering the water levels to 4 inches/ 20 cm. the male will guard the eggs and fry until they become free swimming.